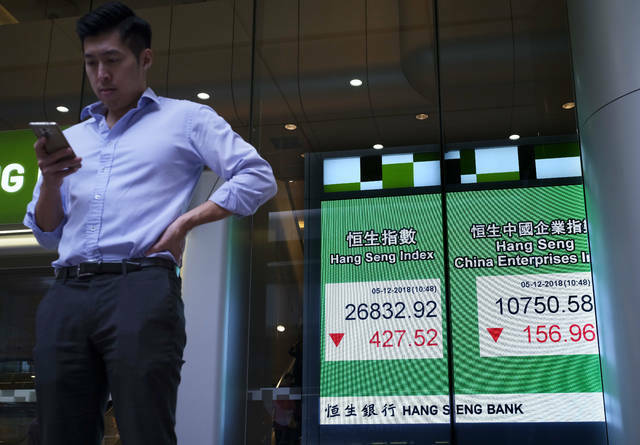 BEIJING (AP) — Global stock prices fell Wednesday, though not as much as Wall Street the day before, amid confusion about what the U.S. and China agreed to in a tariff cease-fire. TRADE QUESTIONS: Investor confidence in the U.S.-China agreement faltered after confusing and conflicting comments from President Donald Trump and some senior officials. That revived fears the disagreement between the world’s two biggest economies could slow global growth. Trump previously said the agreement would lead to sales of American farm goods and cuts in Chinese auto tariffs, but Beijing has yet to confirm that. Trump renewed threats of tariff hikes on Tuesday, saying on Twitter that Washington would have a “real deal” with China or else would charge “major tariffs” on Chinese goods. That cast further doubt on the weekend agreement. In other energy futures trading Wednesday, wholesale gasoline added 0.2 percent to $1.45 a gallon. Heating oil slid 0.6 percent to $1.89 a gallon. Natural gas picked up 0.3 percent to $4.47 per 1,000 cubic feet.